Last week the International Energy Agency(IEA) planned to release 6o million barrels of oil from emergency reserves including 30 million barrels from the US Strategic Petroleum Reserve. The official party line is that the conflict in Libya has removed around 140 million barrels of oil from the market and this could result in tightness of supply and poses a threat to the recovery. The market reaction was to send crude prices plummeting mainly because the announcement was unexpected. Of course we live in a shoot first ask questions later market so the plunge was to be expected. So what is the going on here? There is no way to know for sure but in the current environment both politicians and governments around the world are deceiving their populations or at the very least trying to cover up unpleasant situations. Recent examples are “the subprime crisis is contained” or the “Fukishima reactors are contained”. For the moment I remain like Missouri “Show me” that it is not true. If the Obama Administration was behind pressuring the IEA to take this action then maybe this was the first shot across the bow of implementing a stimulus package a kin to “QE 3”. Energy and oil in particular runs our society so a drop in crude prices translates in to relief for the consumer and businesses alike. At a time when the leading economic indicators have been rolling over and unemployment remains stubbornly high a drop in energy prices could cause a rise in the President’s sagging poll numbers. Maybe it was orchestrated because things are not as they seem. The Saudis were going to raise their production quotas to compensate for the Libyan disruption, but maybe they can’t ramp up production. Even with all the Saudi public pledges to increase supply their production is down from the peak in 2008 over 20%. The House of Saud has been spending billions to keep their population placated during this “Arab Spring” and as a result have put less money back into oil well maintenance and exploration. Since the Saudis are spending less on their oil production capacity it is possible that they cannot ramp up. The reality is that the Saudis are comfortable with higher oil prices as it affords them the ability to keep spending and retain power. Ironically it is not in America’s best interests to drive oil down past $80 as that could cause a destabilization in the region and much larger disruptions should the House of Saud implode. Moreover, as a result of this release the market may interpret the situation as a real problem point and recognize that capacity cannot be increased if really needed during a true emergency. If the release of the oil was politically motivated then it was also short sighted. To start with the Strategic Oil Reserve is just that “Strategic”. The intent of the reserve which has only been tapped 2 prior times was to prevent oil shocks like what occurred during the oil embargo of 1973. This decision in my mind was not strategic in nature as we are and were not in a situation that threatened our economy because supply was unavailable, but instead because we had to pay more than people liked; but when you pulled in to your local gas station you were able to fill up no problem. Using this supply to cushion the price of oil provides a short term benefit at the expense of longer term security. The release comes with some potential unintended consequences relating to oil prices going forward. The world demand for oil has been rising and is projected to continue to rise up to 89 million barrels a day this year. In the face of this rise we are lowering prices to stimulate even more potential demand, which seems misguided at best. The fall in the price of oil also has an impact on those who drill for oil and stop drilling the less economic wells resulting in further supply constriction and higher prices again. Additionally, as I understand it some of the wells that get capped due to the low prices are not restarted as the oil that was being pumped is now not recoverable. Moreover, the oil from the reserve that was used to drive the price down will have to be replaced potentially causing further upward pressure on the price. The ramifications of this decision to release the oil has many implications, but from an investing stand point to me it just confirms that energy and oil in particular are in secular up trends. Even during a period of worldwide economic weakness demand for energy is still growing. 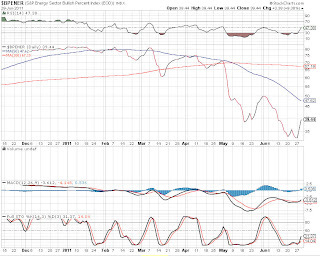 Looking at the energy sector the chart of the S & P bullish percentage indicator has plummeted and created a double bottom in the low 30’s, and has begun rising. 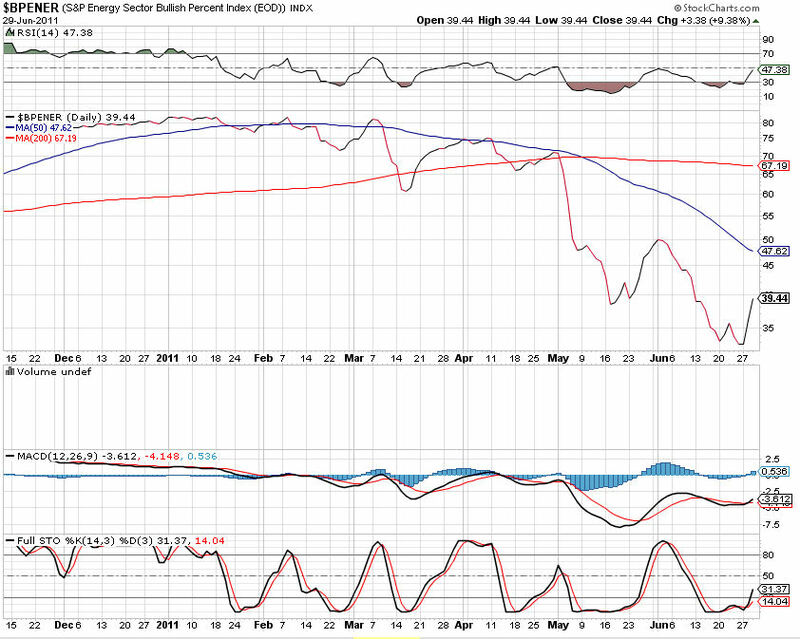 The time to purchase energy related investments has been when the S & P bullish percentage is in the low 30s or lower. Last June the indicator bottomed in the mid 20's. Over the past couple years the indicator has bottomed out in February and then again in June like a seasonality situation. Additionally, if the EU can kick the can down the road and the Euro can stabilize here the environment would favor energy companies whose products are priced in dollars would command higher prices. At this time there are many companies to choose from in the energy sector sporting good statistics and dividends. In the oil patch Chevron (NYSE: CVX) yielding 3.2% looks attractive as does Total (NYSE : TOT) yielding 4.8% and Conoco Phillips (NYSE : COP) yielding 3.7%. The oil sector is not alone as some of the coal stocks look attractive at this time such as Arch Coal (NYSE ACI) yielding 1.8% and Peabody Energy (NYSE :BTU) yeilding .6%. Most investors don’t want to hear this and I am not going to delve in to this at the moment but the uranium sector also is getting to the point where those with a longer term view could build positions. Most of the Uranium stocks have gotten absolutely crushed, but they have also stopped going down and reacting to news. The reality is that Nuclear power is going to be with us and for every government like Germany that wants to step away there are others moving forward with plans to build out. In my opinion Uranium is a sector you should educate yourself about now and then look to build positions for the eventual next rise. I guess the point is I do not know if the release of the oil from the Strategic Reserve was truly political although I suspect that politics was a factor. Regardless of what the reason was the reality of the situation is that as an investor you can take advantage of these down drafts to establish positions at better prices and add to existing positions. The same applies to other sectors as well for example given that none of the factors driving precious metals has been addressed or solved when the market hands you a correction it is time to add or buy in. In any sector where you can identify a “disconnect” a potential great investment opportunity awaits you. Disclosure: Not long any of the stocks mentioned yet...Potentially adding all right after July 4th Holiday.